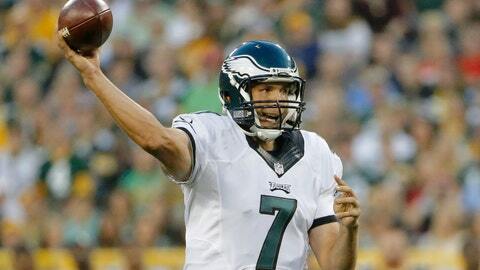 Sam Bradford and the Eagles are hosting the Giants in a divisional clash. The New York Giants will be looking to end a two-game losing streak against Philadelphia when they visit the Eagles for a Monday Night Football match up as 5 1/2-point betting underdogs at sportsbooks monitored by OddsShark.com. The Giants have risen to the top of the NFC East standings with three consecutive straight-up wins, including their last-minute 30-27 victory over the San Francisco 49ers in primetime last Sunday. New York failed to pick up the against-the-spread win as 7 1/2-point road favorites against the 49ers, dropping it to 3-2 ATS this season and 6-3 ATS in its past nine games ahead of Monday night’s Giants vs. Eagles betting matchup at Lincoln Financial Field. However, while riding a three-game SU win streak, New York’s 3-2 record mirrors the results it had prior to its first meeting with the Eagles in Week 6 last year. Things ended badly for the Giants in that clash, with Philadelphia handing them a 27-0 shutout loss as a 1 1/2-point underdog, the first of seven consecutive SU defeats that would define New York’s 2014 campaign. The team also dropped a second straight decision to the Eagles in last year’s regular-season finale, a 34-26 loss as one-point home underdogs. But the Giants have bounced back, also handing the Bills a stunning 24-10 defeat in Buffalo two weeks ago to improve to 3-1 SU and 4-0 ATS in their last four road contests, according to the OddsShark NFL Database. The primary concern for the Giants on Monday night will be the health of receivers Odell Beckham Jr. and Rueben Randle, who are both nursing hamstring injuries that leave their status uncertain against Philadelphia. Even with two of his primary targets hobbled, quarterback Eli Manning has looked outstanding, including last week’s performance against San Francisco, against whom he completed 41 of 54 passes for 441 yards and three touchdowns. The Eagles have struggled to 2-3 out of the gate, a record that starkly contrasts with their 4-1 fast start of a year ago, and have seen their Super Bowl 50 odds tumble to a middling 33/1 after opening the season at 17/2. Philadelphia is coming off a decisive 39-17 home victory over the New Orleans Saints but has failed to tally consecutive SU wins since blowing out the Dallas Cowboys 33-10 in Week 13 of last season, going 3-6 SU and ATS during that stretch including a 2-5 SU and ATS record as betting chalk. However, bettors have found success when playing UNDER the point total in recent Eagles contests, which is 4-1 this season and 6-3-1 in the club’s last 10 games.